Over at Paper Issues, we have a new them up. 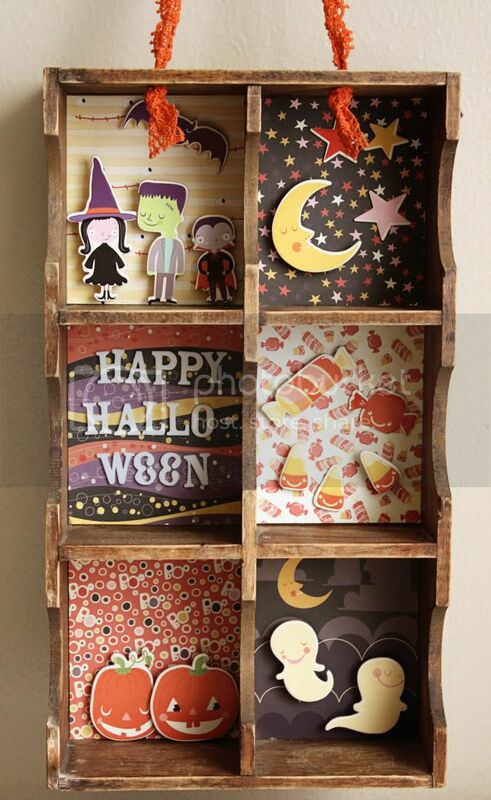 For the whole month of October we will be showing off Halloween projects. In the past I haven't been the biggest fan of the holiday, but this year, I'm getting a little more in the spirit. To get this theme started off right, I'm sharing a Halloween printer's tray that I made. "Printer's Tray" is a loose term for this, but I was thrifting and found this cute little tray for $2.00. I used some Cosmo Cricket Matilda 6x6 pad + chipboard shapes. It really didn't take too long to put this together. I measured out each paper for the backgrounds and then used foam dots to pop the chipboard shapes. I'm so excited to hang this little Halloween scene up. I've also got a paper chain and some decorated candle sticks I'll be sharing in the coming weeks. Hop on over to Paper Issues to link up your projects! Oh! Just one more thing, here's a code for 20% off your purchase in the Paper Issues shop, just use the code HAPPY20. I adore your decorated tray...I really need to do one of these! Cute, cute, cute. This is really cute! What a fun decoration! This is going to be a keeper right, not one of those awesome holiday crafts you make and toss?